FORMER AFL executive Simon Lethlean has returned to football as the new head of St Kilda's football department and Saints CEO Matt Finnis is confident the club's reputation means it can bring in people who have made "mistakes". 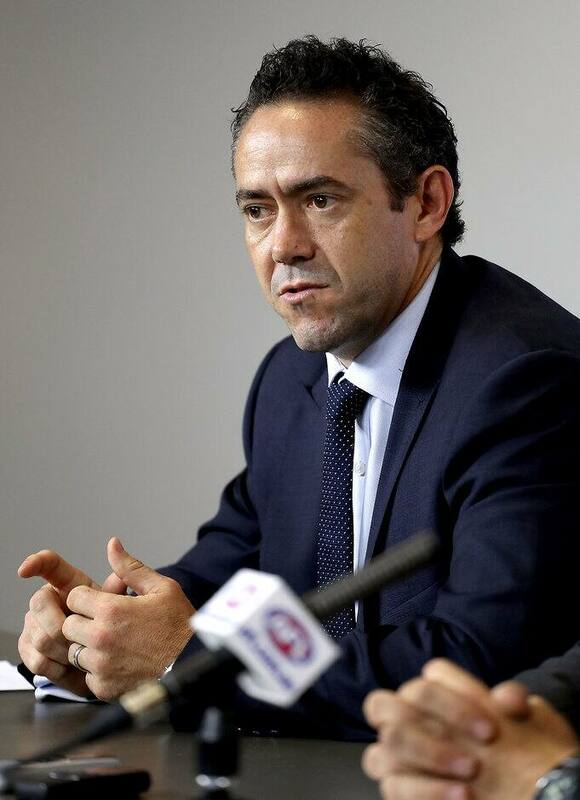 Lethlean resigned from the AFL in July after news emerged he had been involved in an affair with a fellow employee. Finnis announced Lethlean's appointment on Friday morning, saying the former AFL footy boss had been the standout candidate after an extensive search conducted by the club and external consultants Ernst and Young. "We believe that as a club, we've built equity in terms of what we stand for, and that allows us to bring people into our club who might have made mistakes in the past but are prepared to take accountability for that," Finnis said in Seaford on Friday. Finnis acknowledged not all St Kilda supporters would be happy with the decision but is confident the right choice has been made. "People make mistakes and people need to be accountable for their mistakes, but ultimately we're really confident that Simon has demonstrated through his attitude, through the experience that he's had, that he recognises the mistakes that he's made," Finnis said. "He's put his hand up and we're willing to give him a second chance." Finnis said it was important Lethlean owned up to his actions. "What's convinced us is he's taken full accountability for that. Simon's taken responsibility, he's spent the last five months rebuilding trust with those who are most important to him, and they don't work in footy, and he's convinced us of that attitude around accountability," Finnis said. Lethlean said in a statement he felt "humbled" the Saints had offered him a second chance to work in football. "I am passionate about football and am thankful to Matt Finnis, Alan Richardson, Peter Summers and the entire board and club for giving me this opportunity," Lethlean said. "I spoke to the playing group and the entire staff this morning, and outlined my passion for football and the opportunities I see in the role. "I believe I can be part of a team that delivers real and sustained success to St Kilda Football Club." Former football manager Jamie Cox has been demoted and while his exact role has not been defined yet, he will continue to be involved with the football department. "Jamie Cox will assume a new role that affects the grows that we're having as we build an AFLW program, VFLW, academies, partnerships with VFL, both at Sandringham and now with Frankston, as we grow our football footprint right throughout Bayside," Finnis said. Lethlean's appointment follows the departure of former chief operating officer Ameet Bains to the Western Bulldogs to take on the CEO role. The Saints opted to restructure after Bains left. "We took the opportunity to consider what's the right structure and approach to our football program, not just for now, but for the future," Finnis said. "We're a footy club that right now has got 45 elite athletes, but in three years' time, we'll have probably 80 elite athletes, with AFLW coming onboard, with VFL programs, with VFLW and a whole range of next generation academies. " Lethlean will start with the Saints on January 8 when the players and coaching staff return from the Christmas break.